Colorado 811 is in the process of migrating our network to a new service provider as we strive towards providing better service and reliability to Colorado. 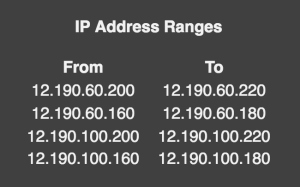 A major step in the process involves moving from our existing IP addresses to new IP addresses. This means that all online services will be migrated to new IP addresses and updating our DNS. It is critically important that your IT department allow internet and network traffic from our new IP address range to traverse your computer network in order to avoid a service disruption. The Domain Name System (DNS) converts human readable domain names such as www.colorado811.org into Internet Protocol (IP) addresses like 12.90.60.167. All customers connected to the internet use this service whether they are aware of it or not. All customers need to ensure their PC’s, servers, routers, firewalls, and any other networked devices that require access to Colorado 811 systems via the internet have our new DNS IP address ranges programmed/whitelisted. On 12/16/18 at approximately 10:00 AM, the old DNS IP addresses will be changed. The old IP addresses will start to fail shortly after if you have not prepared. Failure to take action may negatively impact your access to Colorado 811 online services. What addresses do I whitelist? Please note: All Network infrastructure and systems should be reviewed in case old DNS addresses are hard coded. If you do not filter specific internet traffic on your network, you may not be impacted. You should check with your IT Department to be sure.